As part of a program to improve the quality of residential life on campus, a four unit apartment building was transformed into a 23 bedroom sorority. The interior of the Colonial Revival structure was re-built, and the exterior was repaired and extended in a sympathetic architectural style. A First Floor meeting room in which the whole sorority can gather was created with an adjacent shared kitchen and dining room addition. A terrace extends the living space outdoors while providing the support for a barrier free access walkway. All the bedrooms are singles, many with bay windows or interesting ceiling lines, and each with individual temperature control. Foam insulation, high performance windows and heat recovery drain lines are important parts of the energy efficient design strategy. 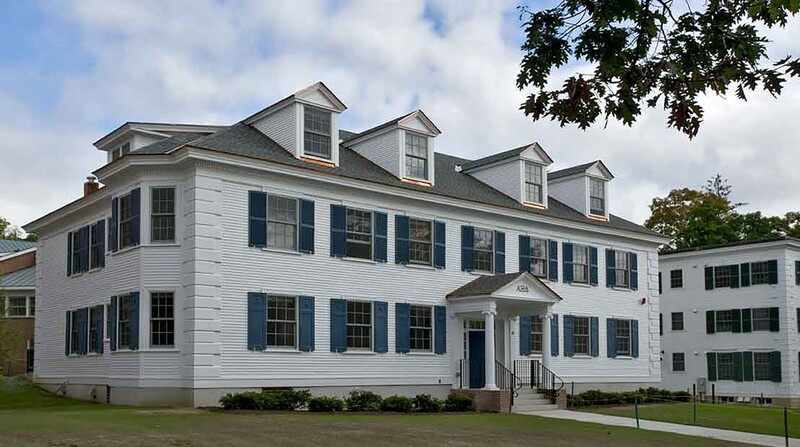 With hard wearing materials and environmentally friendly products that will reduce maintenance and ensure good indoor air quality, this sorority complements Dartmouth's commitment to sustainable design.